Spread pecans onto a baking sheet. Bake pecans in the preheated oven until toasted and fragrant, 5 to 7 minutes. Set aside to cool. Whisk 1/2 cup orange juice and cornstarch together in a small saucepan; cook and stir over medium heat until mixture thickens, 3 to 5 minutes. Remove saucepan from heat and stir in honey until dissolved. Stir remaining 1/4 cup orange juice, olive oil, lime juice, tarragon leaves, salt, and pepper into orange juice mixture. Chill dressing in refrigerator, at least 30 minutes. 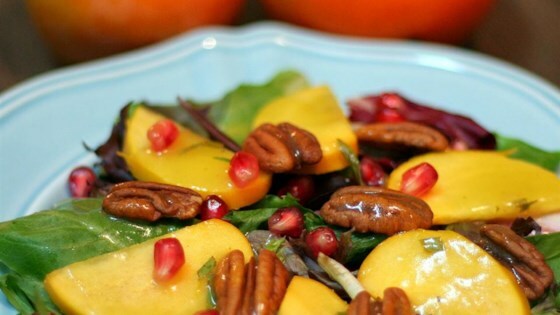 Spread herb salad mix into a serving bowl or on individual plates; top with persimmon slices, pomegranate seeds, and pecans. Drizzle cooled dressing over salad. We really liked this! Different, tasty salad. I forgot the pecans and it was still good but would be better with the crunch! This is so unique! It tastes and looks amazing. I didn't change a thing. A festive holiday salad.